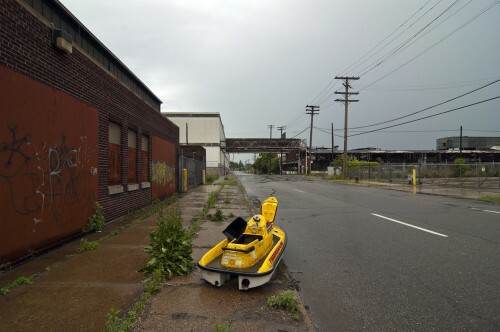 A BOAT LIES on its side in an empty lot. Abandoned in a neighborhood miles from the water, a neighborhood where no one can afford boats, let alone the truck and the trailer that would haul the boat there. But there lies the boat. Now multiply that boat by fifty or even a hundred, tossed over the years in lots all over the city. It isn’t a metaphor. They come from the suburbs, dumped in Detroit because that seems to be the easiest and cheapest way to dispose of such a thing. They dump other things too, none of it legal, and it all becomes a part of a neighborhood. There are other stories that are harder to see. An empty, boarded-up house might represent someone who has moved on, a symbol of the abandonment this city has seen as thousands of people have, over time, moved out beyond the city limits. But that emptiness might indicate another history. Numerous banks that held mortgages on Detroit homes have, in the past decade, forced the evictions of delinquent owners. Then, after evicting the owners, these banks have not taken the next step of actually foreclosing on the homes, instead leaving the Detroit properties in legal limbo, empty and decaying. The banks have abandoned tens of thousands of these homes, all over the country, but according to a 2010 Government Accounting Office study, they walked away from more homes here in Detroit than anywhere else, costing the city millions of dollars a year in unpaid taxes. For a city cutting services like police, schoolteachers, firefighters, and where they’re shutting down parks, it’s not hard to explain how much that money matters. Why wouldn’t the banks just take the logical step of foreclosing on the home? By doing so, the bank could resell the house, recouping some of their losses. But in Detroit, the value of a home barely covers the cost of the bank’s lawyer appearing in court, and once they have foreclosed, the bank will be liable for the empty home’s taxes. 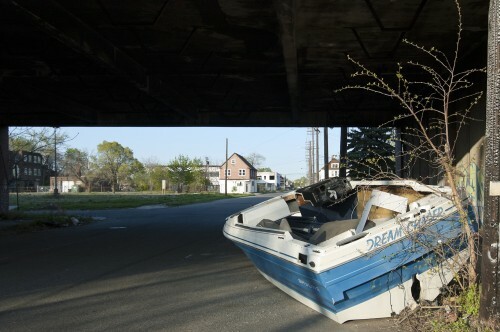 Scott Hocking, "Dreamchaser, Concord St.," Shipwrecks series, Detroit 1999-2013. Courtesy of the artist. I made an offer on a foreclosed home, a beautiful empty Queen Anne on West Grande Boulevard, not far from Clark Park where I play tennis. The realtor told me the bank would probably get back to me in a month or so. Because it involved a foreclosure, he warned that it might be as long as 12 weeks. My plans for the house were fairly simple, and I began looking for contractors who could do the work. I got to know the next-door neighbors, a nice couple who had beautifully restored their own home. After 12 weeks I contacted the realtor and he said he would call the bank. Then the neighbors called to tell me homeless people had broken in. Though I had no legal right to, I paid to secure the building. By the middle of the summer, 24 weeks after I had signed my offer and after the neighbor called about two more break-ins, I told the realtor the deal was off. We withdrew the offer from the bank that had never bothered to respond to it in the first place. That house is still empty, and the neighbors have moved away. Some people say the city is the way it is because the poor rely too much on government handouts; that they’ve lost the ability even to work and the motivation to take care of themselves. There are anecdotes about how the poor are gaming the system, driving around in Cadillacs. Last fall, I went to clean out another abandoned home in Detroit. We had bought it for $1,000 at a city auction. The home was filled with the previous resident’s belongings, a grotesque sea of possessions, clothes, books, broken furniture, all of it soiled and worthless. The pieces left behind told fragments of a story. There was a letter from the resident’s mother, telling her she believed in her daughter; there was a letter from the resident’s boyfriend or husband, telling her he understood he had screwed up and when he got out of prison he was going to do right by her. There were children’s toys and college textbooks (Architecture! Design!) and a résumé that listed her experience working at every fast food chain you can think of (Wendy’s, Church’s, McDonald’s, etc.). There was medicine, and there was a Bible. I wondered where she and her family had gone. I had a feeling they had not driven away in a Cadillac. Across the street was a crack house. Cars came and went, reinforcing the fact that there is no stereotypical addict. White people, black people, Hispanic, rich and poor. It was a quiet and orderly business. A kid sat playing in the parked car while his dad disappeared inside for awhile. A man I can only describe as “a scary looking dude” came and stared at us cleaning up the house. I was tempted to ask him if he knew where the girl and her family had gone. Next door was a Bangladeshi family. They have a beautiful garden in the backyard. They did not seem particularly bothered by the crack house. Down the block was another abandoned house. A few weeks later, it burned down. I had to wonder who did more damage to the neighborhood, the crack house or the banks that walked away. I figured it was probably a tie. It might sound like I am looking for a villain; I’m not. Though clearly, the drug dealers are profiting from people’s weakness (“criminals!”), and some might say the same of the banks, pushing the mortgages on people who wanted but couldn’t afford them (“evil corporations”), and some might blame whoever took that mortgage out in the first place (“those people”), while others remain high-minded about it all and speak in coded phrases and economic abstractions. But for the most part, everyone is well intentioned. They are all doing what they believe they are supposed to do. They are responsible, and they do their jobs. At the banks, quarterly and annual profits goals are set and must be reached or there will be layoffs, and if it is a system that creates undesirable, even tragic, outcomes, well, as long as profits are met, nobody seems to question those systems, for profits and “growth” seem to be the only objective measurement to which we are held in our society. It may be the tragedy of our times, but it’s also one we collectively refuse to examine. Meanwhile, up the street, a group of artists have taken over other abandoned homes, activating the entire block. Community gardens have sprung up to feed the neighborhoods, and new urban farms are supplying the new restaurants that have opened downtown. Positive forces are working against the entropy, and the void will be filled; the city sits at a natural crossroads, it is only a matter of time. But vultures still come in to tear at the wounded beast. In the papers you can find the story of Michael Mallett, a respected business owner and resident of Natch, Ohio, who bought a historic Detroit home in a historic neighborhood and then hired workers to tear the limestone off of it. The workers had no permits because Mr. Mallett had not bothered to get any, perhaps he thought in this abandoned city no one would notice. But vigilant neighbors did show up and, with the damage already done – an ugly hairlip tear ripped through the center of the home’s façade – the workers were hauled off to jail. But Mr. Mallett wasn’t. He went on with his life. The suburbanites who abandon their boats and garbage and the anonymous junior bankers who sit far away in their vast sea of beige cubes clicking tirelessly towards their profit goals, they all go on with their lives, justifying and rationalizing the various roles they play in the abandonment of the homes, the devaluation of surrounding properties, the subsequent impact on the tax rolls and city services (schools, cops, firemen) and the ruin of neighborhoods that a lot of good, hard-working people still call home. 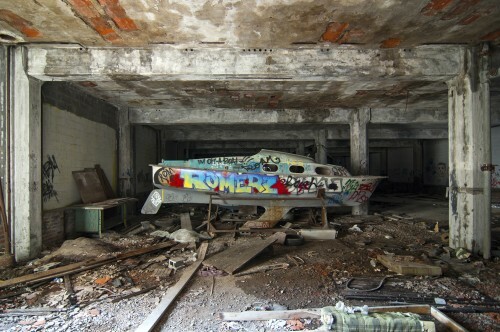 Scott Hocking, "Packard Sailboat," Shipwrecks series, Detroit, 1999-2013. Courtesy of the artist.